The bear is a large mammal. Bears are omnivores and regularly travel long distance to collect their food. In certain regions their fur is used by humans. They are also used for their bile (bile bears), used in traditional chinese medicin. Severe animal cruelty happens in so called bear-farms in China and Vietnam, in which moon bears are often kept and "milked" in extremely cramped metal cages for many years without any movement or freedom. 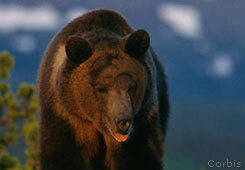 Bears are also threatened by a reducing habitat.